This is a rare solar eclipse in which the Sun and Moon conjunct Pleiades. Conjunctions mean all bodies involved appear in the same area in the sky, sometimes in exact degrees, which is the strongest point of a conjunction. Effects of this alignment can vary depending on which planets are involved. 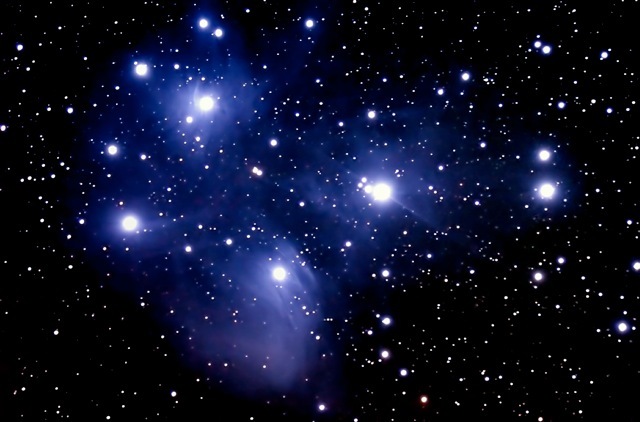 Pleiades is also known as "The Seven Sisters" as there are 7 main visible stars. It is situated in the constellation of Taurus. Alcyone, it's main star, is said to be a sister star to our own Sun. Many believe Alcyone holds the Akashic Records. Many tribes on Earth say they originated from Pleiades, such as the Cherokee, Hopi, and Mayan. Information from channeled sources say the Pleiadesns are in our future. They know what we are going through as they have been there themselves. In the summertime, when we are looking at the Milky Way, we are actually looking at our galaxy. Somewhere between Scorpio and Sagittarius constellations is Galactic Center. In winter and spring while the view of the Milky Way is in the Southern Hemisphere, we can see Pleiades in the Northern Hemisphere. When we are looking at Pleiades, we are actually looking at the outer rim of the galaxy as the Pleiades system is further from Galactic Center than our solar system is. It is in the opposite direction from where we are. Pretty amazing, if we realize what it is we are looking at. With the Sun and Moon accenting that area of the sky, I'd say this will be a time for us to remember our star heritage, and open up communications/channels to the beings that live in this system. The Sun and Moon will be leaving the sign of Taurus and entering into Gemini. Gemini is ruled by Mercury - the messenger of the Gods - so be prepared to get intuitive information, or messages in your dreams. It is a good time to communicate to your guides in prayer and meditation. Venus recently passed close to Pleiades on April 3, 2012, with Jupiter nearby. It is important to note when so many major influences are situated in the same area of the sky that this is telling us something. Sun represents our personalities and the moon our emotions. Pleiades represents our past and our future. It is time to integrate ourselves in the present and bring that awareness into our every day lives, that we are part of a cosmic family & history and our future is more than just continuing on the same path we've been on for the last 5000 years. A new cosmology is revealing itself. I would not be surprised if there was an increase in UFO sightings that weekend! Keep looking up! very cool Amber thank u for the info...what a strong year i really want to do as much as i can spiritually love and miss u!